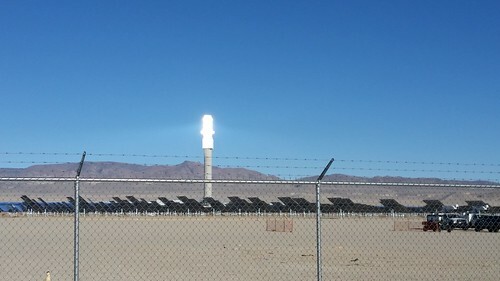 One of the things Lisa wanted to see was the Crescent Dunes solar thermal power plant, located about 15 miles northeast of Tonopah. 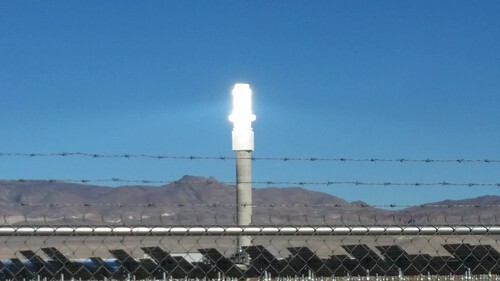 We could see the plant clearly from the Mining Park, with the power tower glowing from the sunlight focused on it from the thousands of mirrors. So after we left the mining park, we decided to drive out to have a look. There are no public tours of the site, but there is a small kiosk just outside the gates with information about the plant, and from where you can get this view of the blindingly-hot tower. Lisa walked ahead of me to read the displays in the kiosk while I took pictures of the power tower. This is not a field of photo-voltaic panels. 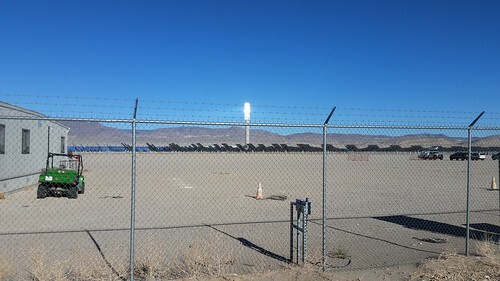 The thousands of computer-controlled mirrors focus the sun on the tower, which is used to heat salt to 650°C. The salt is held in a hot salt tank, from which it then is used to boil water which produces super-heated steam, which drives turbines to produce electricity (110 MW) before being condensed and recycled. The now-cooler-but-still-molten salt is then pumped back up the tower to be heated again. The key thing here is that unlike photo-voltaic generation, this plant produces power continuously, even at night and when it's cloudy. The hot salt keeps the power going all night long. They are very proud of the fact that this plant does not have a standby natural-gas "trimmer" plant associated with it the way many other solar power plants apparently have. 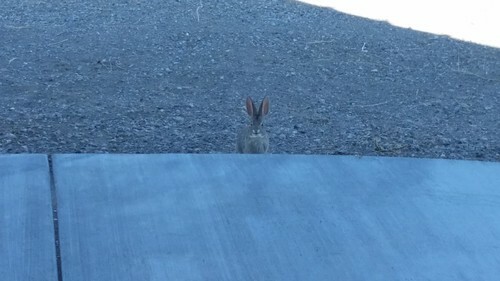 While we were reading the displays, this short-eared rabbit popped its head over the edge of the path to look at us and to nibble on the plants growing alongside the kiosk. The bunny didn't seem too perturbed by Lisa looking at the displays. Eventually the rabbit hopped away when I came closer, though, loping over to the shelter of a piece of loose pipe along the plant fence. We didn't spend a lot of time out here. 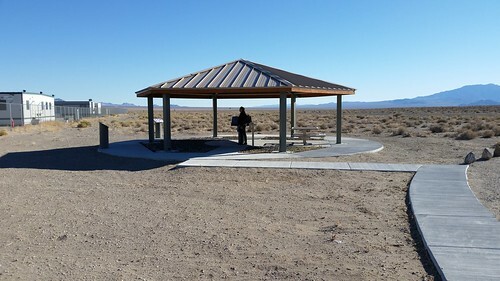 But had we known the kiosk had a picnic table, we might have considered bringing a picnic lunch. 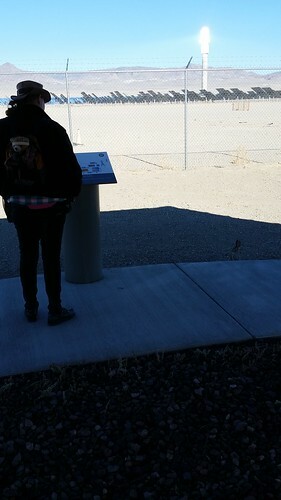 By the time we headed back to Tonopah, we were getting pretty hungry. 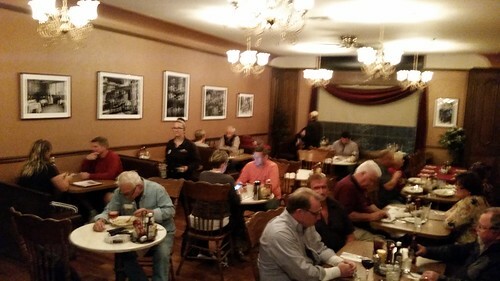 After considering several options, we elected to return to the Pittman Cafe, opting for a simple meal of spaghetti tonight in contrast to last night's salmon creation. 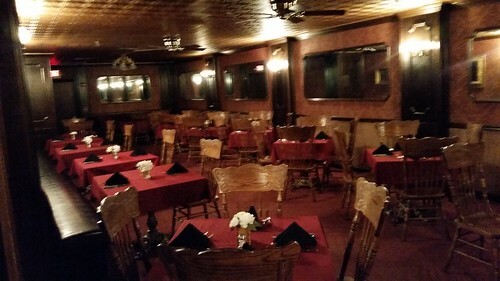 After dinner, I was able to sneak in to the Jack Dempsey Room — used now only for special events — before we returned to the hotel, where we spent the evening relaxing. We were not sorry to go back to the hotel, walk next door and get a few snacks from Raley's, and spend the evening kicking back in the luxury of our suite. We're both really tired. My pedometer turned sideways in its pouch, so it wasn't reading correctly, but I feel like I must have walked at least 15 km. Again, I'm happy to not have to be up early in the morning.